Frank Moses (Bruce Willis) is bored. A former CIA agent of great importance now living off of retirement, the highlight of his day is when he calls Sarah Ross (Mary-Louise Parker), his benefits representative whom he flirts with. Things take an exciting turn, however, when a hit squad breaks into his house and attempts to kill him. After putting down his new foes, Frank then sets off across the country to round up all of his old comrades (Morgan Freeman, John Malkovich, and Helen Mirren) as he tries to figure out who's trying to kill them and why. 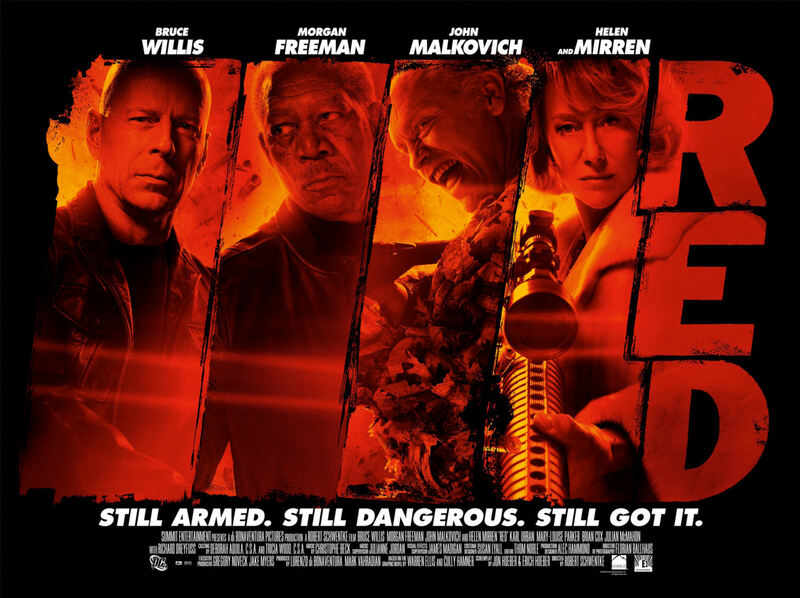 Similar to "The A-Team" and "The Losers", "Red" is all about stylized action. It revels in its ridiculousness and has a fine appreciation for over-the-top explosions. Based on a graphic novel, 'Red" doesn't waste time with such issues as reloading, collateral damage, or the laws of physics, something I can certainly admire when done correctly. "Red" left me feeling a bit cheated, though. This movie is a lot of fun but it could have done so much more with the premise. The misuse of such a great cast is criminal. Willis is excellent, bringing visions of an older, more mature, but still awesome version of John McClane. Everyone else seems to be mismatched or out-of-sync as they just aren't given much to do. I have no idea why Morgan Freeman was cast in the first place. If you're not going to use Morgan Freeman then why bother adding him to the equation? Likewise, the story is jumpy, going from place to place, event to event, without much development or wrap-up. It's a bit like a video game as our heroes (or anti-heroes as the case may be) go from level to level. And just like "The Losers", "Red" lacks a compelling villain which could have helped me overlook the movie's other flaws. It has its moments (mostly in the first half), not to mention an excellent supporting part from Bryan Cox, and I can't deny the entertainment value as a whole. I simply expect an action movie with this level of talented actors to provide me more than above average entertainment.